With The PEZ Guns, I Chose Death. now, With everyone knowing how many exist does that make them worth any less than they were worth yesterday or two months ago when everyone didn't know how many there were? David at Small Town Co.
Pez Outlaw - A recurring theme from the time when I bought n sold pez was the following scenario. Somebody contacts you with X amount of product n you buy it. Then they find more, n you buy it. Then they find more n by now your sick of it but you are told if you don't buy it they will sell it elsewhere devaluing the investment that you've made so far. Basically Blackmailing you into buying tons of stuff you do not need or want. Finally with the last time this happened, the orange spacegun n orange shooter deal, I lost it. The gun deal unfolded pretty much as I've explain they always did buying Pez from Europeans. A big initial buy, then wow there is more, then jees I'm as surprised as you, there are more. It would actually be funny except for the fact that it was always so much money involved. The Europeans always figured each new pigeon was brand new. Unfortunately I was not, not to mention this gun deal fell in the middle of me trying to salvage my life while Pez Corporation was trying to destroy it. Europeans also have selective English speaking skills. If you agree Europeans understand English, If you disagree or ask questions non comprede senor. Once you start saying what Europeans like again, voila there ability to understand English miraculously returns. Already mad as hell, I sorta lost my mind when that tired, tired scenario I had experience so many times before unfolded once again with the Orange Pez Spaceguns & Shooters. Like I said I lost my mind. Finally having had enough, I told the Europeans to go to HELL. 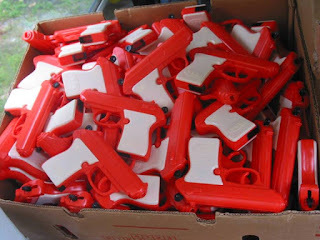 Having already in my possession a large group of product we went to war. The usual threats by them, if you don't buy it we will just sell it to somebody else. My response was I sold the inventory I had at cost & below cost retail to Pez Collectors, thereby destroying the Europeans potential market for there newly found product. I had finally had enough of the European Pez Dealers & there "finds". I was determined I would have there guts for garters this time. Just once someone would pay for this kind of behavior. I'm glad that I started writing this all down over a decade ago, because not real sure my memory is going to hold out. I've always been terrible at remembering names and faces. I seem to forget the names and faces of people I meet almost immediately. I'd blame age except it's been this way for as long as I can remember. Dead AL was one of the biggest liars I ever bought pez dispensers from and that is saying a lot when you factor in German Andre. Though in the end he was a harmless n tragic figure. What will surprise you is I really liked this guy, he died of what I believe was a drug overdose of all things. I say of all things because he was the most accident prone guy I've ever known. Dead Al once used a Skill saw on a wall while remodeling with no regard for what might be in the wall or where it might be located. Catastrophic and predictable results ensued to his arm. This is only one example of many. I knew Dead Al for a year or two n every time I talked to him he had another story involving an injury to some part of his body from an ill conceived endeavor. I bought thousands of no foot Pez dispensers from Dead Al before he died and he always promised that this time it was everything. I can still hear his oath, "may god strike me dead if I'm Lying". He really said those words. It never was everything n God did strike him dead. I heard the news of his death from a relative on my last call to his store. I've told you that when I was young I abused drugs, which gives me an insight to read between the lines when people are cryptic in describing someones death. Add to that Dead Al mentioned his drug use. All things said, I liked Dead AL, he was one of those characters that you meet once in a lifetime. Most people that repeatedly lie to you you end up disliking. Dead Al was different, his life was so tragic that you could not help feeling sorry for him. If somehow part of the Pez Outlaw legacy is that Dead Al is remembered, I'd like that very much. Dead Al in a very odd way was a friend, characters like him should be remembered. Total amount spent on 9,936 Pez dispensers bought from Dead Al was $32,667.00. Below is a Breakdown of the pez I purchased from Dead Al. Left to Right. Practical Pig A, Pez Pal Sheik, Pez Pal Maharaja and Captain Hook. Maharajah 2,128 Pez dispensers @ average price of $3.83 each. Captain Hook 1,130 Pez dispensers @ average price of $9.22 each. Sheik 1,373 Pez dispensers @ average price of $5.13 each. Practical Pig A. 1,805 Pez dispensers @ average price of $2.53 each. Donald Duck & Mickey Mouse. Picture courtesy of Rudi. Mickey Mouse with removable nose 2,150 Pez dispensers @ average price of $.68 cents each. Donald Duck Rubber removable hat 1,350 Pez dispensers @ average price of $.78 cents each. I gave you average cost per no foot Pez dispenser because the price kept going down with each buy. There were 4 buys total & with each buy he said this is all or may I be struck dead. Never was & he was, by a drug overdose. I tell you though I loved this guy. Every phone call was a new adventure in the life of the most accident prone guy I never met. The final deal with Dead Al buying Pez dispensers was after he died. 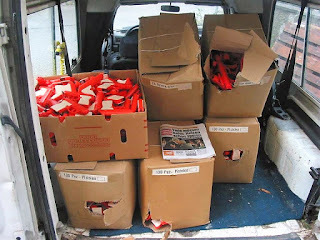 Mike Mitros drove out to Bambi's house & picked up $10,000.00 worth of Pez dispensers. It was the only way to complete the deal. Then Mike shipped the Pez dispensers to me. All I remember from this deal was when it was completed I had a large round trash can full of Mickey nf Pez dispensers & another full of Donald nf Pez dispensers. Bambi still has a bunch more no feet Pez dispensers. "if you don't quit yelling and cussing at me I'm not gonna sell to you anymore"
Finally we're on the same page. I met Helicopter Bob in roughly 1995- 1996, he was connected to Pez USA in some fashion. He and one of his buds found a bunch of Pez dispensers in one of the buildings at Pez USA. Pez pal cops and golden glow pez dispensers were two of the more notable pieces. Well they got the Pez dispensers out of there and began selling to John Laspina and other dealers. Later at a show in Atlantic city and up walks Helicopter Bob, he says hey I have 200 pez pal cops do you want to buy them? I said sure and we settled on a price, so off he goes to get the Pez dispensers. All the way back to me he is busy selling the Pez Pal Cops one by one for $5.00 each more than he agreed to sell them to me for. You would think this kinda thing was uncommon, when actually it was more the norm. From Helicopter Bob to the 2 Andre's to Dead AL to the Austrian gun brokers, there was always more and in addition backhanded dealing going on. Ole H Bob was just the first in a long line of seedy characters I had to do business with. I remember H Bob saying to me once " if you don't quit yelling and cussing at me I'm not gonna sell to you anymore Pez dispensers." Finally I think he was hearing me. Total amount spent with this guy only a few thousand dollars. Unlike Dead Al who I liked very much, I did not like Helicopter Bob at all. H Bob was all the seedy n none of the charm. Not one cool story about H Bob, with Dead Al there were good stories to counterbalance the bad behavior. I like good stories and unique characters. This lady has or had around 10,000 to 20,000 no feet Pez dispensers. She is the hardest person in the world to buy Pez dispensers from. Every time you get close to finishing a deal she spooks like a deer in headlights. Finally I just gave up, as it was just a massive waist of effort. Besides I learned a ways in that, again there was more every time you thought you got it all. Also her relatives have been taking small amounts of Pez dispensers out at a time (she has no idea) & been selling them for years to big name dealers (the guys in Florida). She called again about a big pile of Pez dispensers she said she had just last May. I never even considered returning the call. I remember a pez story from a bit before my time. There was this store John Laspina. used to go to. In this store there were these barrels of no feet Pez dispensers being sold kinda cheap. John & some of his friends went a bit wild buying. Enough so that proprietor pulled the product figuring that they had under valued what they had. I believe this was Bambi & her pez dispensers. Location, personality & pez dispensers on sale lead me to this conclusion. Bambi was always the kind of person who worried endlessly that she might not be getting the last penny possible. Which is why Dead Al her nephew or grandson was a Godsend. You could at least reason with Dead Al. Ironic thing is what bambi held so tight is now being stold from her & in the end she will get nothing. KOA absolutely never had a kind word for my company n never missed an opportunity to undermine it. 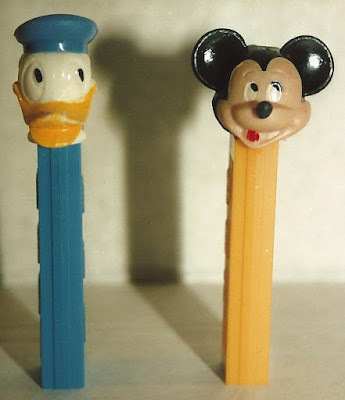 Two people were at the source of almost every rumor that my pez were fake, Scott McWhinnie n KOA/Johan Patek. Most of the rumors that my Pez were FAKE pre Scott McWhinnie originated with KOA. He probably never knew that I was aware of that. KOA felt I had no business operating in his Kingdom. Are you aware that KOA was paid to be at conventions in the 1990s. Free everything, room, tables, fees etc, I believe even travel. Upon hearing of the finds I was making in about 1994, the first words out of KOA's mouth were. He is having these made. Really that's the first thought you had, you being the King of finding old product? 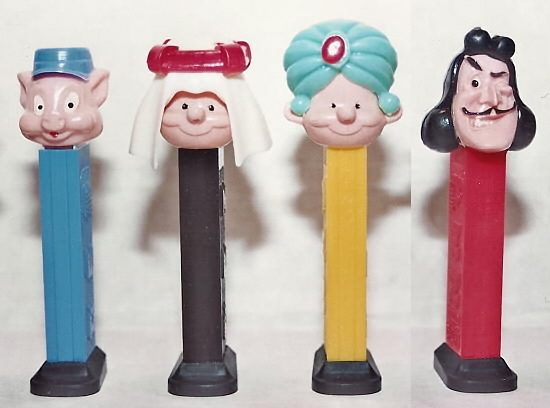 I bought and sold more Pez Dispensers than anyone ever in the hobby except Pez Corporation. Believe it or not I was accused by a person who ran the Biggest Pez Convention in the country of making Pez in my basement. By no coincidence, this person used to comp/pay The King Of Austria to come to there convention. When I first met the King the thing I remember most is, he found it very difficult to hide his contempt for me. It was very clear he felt I was trespassing on his domain by buying pez dispensers in Europe. On one trip I just showed up at his flat. I waited outside till he drove up on his motorcycle, then just walked up to him & introduced myself. Where he said I know who you are. What are you doing here. I said, Well I wanna buy some of your pez dispensers. The King then replied, What if I hadn't showed up. My rely, Well I would have missed you then wouldn't I. Reluctantly he took me upstairs & showed me his very impressive pez collection of rare pez dispensers, sculpted pez prototypes, pez prototypes & pez molds. We then had to go over to his other house to fill my Pez dispenser order. I drove, to which he commented, they let you drive at home. At the other house I was told to wait on the other side of the hedges that surrounded the place. While he went in to get the pez dispensers. I found a lot of things odd about this house with the tall hedges that the King seemed to not want anyone to see or go into. The situation reminded me way to much of when I was a kid buying drugs. Same deal you waited at the curb while someone else went in. The questions I had are many. Like I've said. I'm not Brand New. This ain't my first rodeo. Upon completion of the deal it was pretty clear to me that I should not show up here again. The deal this time was to get rid of me & that I should buy his Pez dispensers from john here after. Though a couple years later the King did offer me 100 green hornet Pez dispensers saying he would stop selling the rest for 1 year if I bought them. One more thing here about the Green Hornet dispenser. The king offered me 100 of them, no big deal he's offered a lot of people 100 Green Hornet. What you don't know is at the time I thought the price was to high, so I had a friend email the King & offer him a bunch of Green Hornet. This I agree was a stupid n childish thing to do, but his reply is the interesting thing. He replied to my friend. No thank you, I know who you got them from, be careful with them. What a very odd thing to say n yet very interesting thing to say. The King also indicated that this person my friend must have gotten them from, must need money pretty bad if he sold to him. All of this just sounded way fishy to me even back then. Who was this mysterious person who was taking a big risk selling the Green Hornets & why would you need to be careful with these dispensers. The king said to me "You like to sell fast, I like to sell slow. We will see who was right." On my first few trips to Europe (trips 1, 2 n 4) Joshua accompanied me. Then again later for my trip to Spain, I just couldn't do it without him. The reason is Joshua was in college at the time, so getting away for my adventures was a bit hard. After he graduated Josh was a broker for a while then he came to work for me n did a trip to Europe for me so I could stay home. After over 70 trips to Europe in 10 years I was getting kinda tired of it. During those early trips with Josh a lot of European real-estate was covered. We drove all over in our little clown car. Here's the thing, in the USA you drive 2 hours usually your still in the same state, in Europe 2 hours n you are in another country. So we crossed a lot of borders. The second thing about those first few trips in Europe was. Much as I had in Canada we did a lot of buying in stores retail as we traveled. Which could n did make all those border crossings interesting. Somewhere in Eastern Europe Joshua n I drove up to a border crossing as we had many times before. As we pulled up to the booth, I swear to god these three eastern European border guards were in the booth hitting each other. Finally one stepped out and he was not happy with all the bags of pez dispensers. He made us dump them all out and show cash receipts. By the way these guys were carrying machine guns. I noticed when bagging it all up that some of the Pez dispensers had vanished, but you usually don't argue with machine gun toting eastern European military. Austrian gun toting military ok, but not eastern European, especially not in 1994 only a few years after the wall came down. Old military habits and points of view die very hard. Anyway we were again on our way, though not before they said don't do this again. We did of course, but not ever again at that crossing. After the first few trips I stopped buying in countries other than Hungary or Slovenia. Though I did buy in the country I was going to fly out of such as Germany, Austria, France or Switzerland. Even though Joshua only went on 5 trips out of well over 70 I still think of Josh as Mr 10%, because I couldn't have done this without him. In the beginning and at any other point like shows etc I could and did lean on Josh. Joshua was an indispensable man in my Pez Adventure. Joshua will get 10% of anything I ever earn that is Pez related, which includes anything to do with Pez Outlaw.